Having risen from the ashes of the great quake and fire of 1906, The City was ready to invite the world to a party. 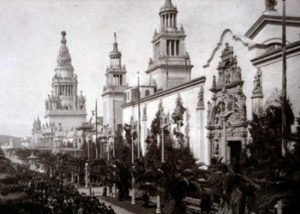 To celebrate the opening of the Panama Canal and the rebuilding of the city, San Francisco played host to the Panama-Pacific International Exposition of 1915. Many architecturally rich, though temporary structures were built for this world event. One such structure, Festival Hall, was a large dome-shaped auditorium and served as the first home of the Exposition Organ. The search for the perfect pipe organ befitting the fair’s tradition of exhibiting the latest advances in technology began in 1913. The new organ was to have a four-manual movable console, 7,500 pipes and not to exceed $50,000 (the equivalent of roughly $1.5 million today). Thirty-one American organ builders vied for the honor of constructing the instrument. Competition among these prominent builders was fierce, but in March of 1914 the Austin Organ Company of Hartford, Connecticut was awarded the contract. The Austin firm had only eleven months to build and install one of the largest pipe organs in the world. The organ was so technologically advanced that its reputation alone attracted attention and brought notoriety to the Exposition. San Francisco’s Felix F. Schoenstein & Sons, longtime installers of Austin organs, took on the heroic task of installing this monumental pipe organ. Eventually, four generations of Schoensteins would care for the instrument over several decades. The organ was shipped in five large railroad cars and arrived in San Francisco in late October, 1914. A team of horses and a flat body truck were needed to move the material from the train and through the mud of the unfinished fairgrounds. Actual installation began on November 7, 1914. With carpenters, plasterers and painters still constructing Festival Hall, installation was frenzied. Pandemonium reigned in the huge structure as the various contractors took an “every man for himself” attitude. The fair had attached a $100 per day fine for unfinished exhibits to each of their contracts. The Schoensteins had only three and a half months to finish the installation and eventually worked in double shifts: during the day they assembled the mechanical parts of the organ and during the quiet of night tuned each of the 7,500 pipes.